The Diploma in Accounting programme is designed to provide a strong foundation in the general aspects of business and accounting and prepares students with the effective skills to support the accounting function of a business and the processes of a company. This course also provides the learning of how business elements integrate with each other enabling them to communicate successfully in any business environment and in a nutshell, Sunway DIA nurtures business knowledge and experience by preparing students to join the work force or for future studies in the accounting field. 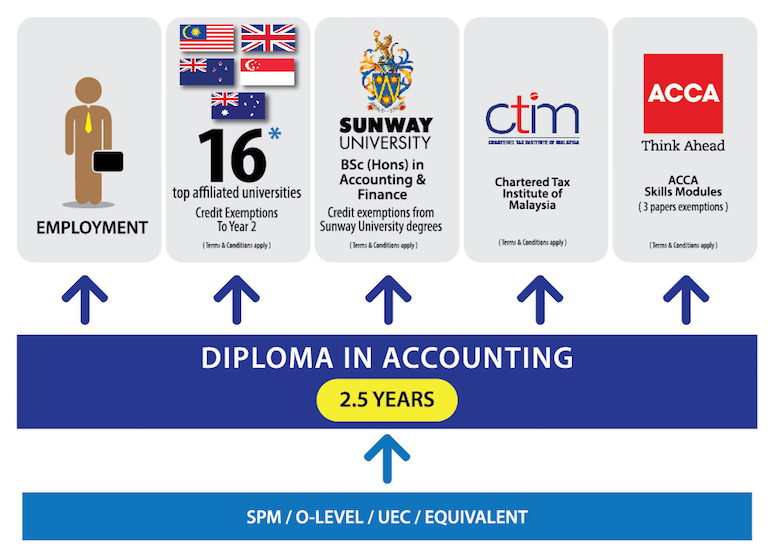 The Sunway Diploma in Accounting graduates will have the option to enter into Year 2 of undergraduate programmes at a wide range of top ranking local and overseas universities, including Nottingham University Malaysia Campus, University of Waikato, New Zealand, University of Canterbury, New Zealand, Birmingham City University, UK, University of Western Australia, Curtin University Sarawak and Australia, Swinburne University of Technology, Sarawak Campus, James Cook University, Singapore, KDU University College, Victoria University, Melbourne, Australia Catholic University, Sydney, Cardiff University, Wales, Kaplan Higher Education Academy, Singapore, University College of Technology Sarawak (UCTS), UCSI University and Sunway University. With our articulation pathways, our DIA graduates can choose to study overseas in the United Kingdom, Australia, New Zealand or Singapore. DIA also allows for progression to professional accounting qualifications offered by Association of Chartered Certified Accountants (ACCA) and Chartered Tax Institute of Malaysia (CTIM), and obtaining the DIA is the first step towards becoming a chartered professional accountant. Prepare students to be able to apply their knowledge and skills to support accountants in planning and decision-making in different business contexts. This qualification can offer students good job stability, and also the ﬂexibility of a wide range of career options, in many diversiﬁed ﬁelds such as portfolio management, investment banking, broking and ﬁnance. Students can expect excellent career prospects, good starting salaries and a fast career progression track, with the strong technical skills students will acquire taking up this diploma course. This will place them in good stead for ﬂexible career options & further educational advancement. All of these careers involve practicing ﬁnance and investment principles as the primary career emphasis. ** Not all subjects subject to will be offered every semester and are availability.